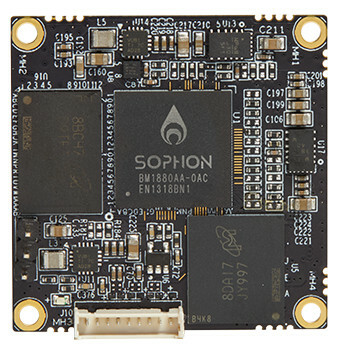 The open spec, Linux-driven Sophon BM1880 Edge SBC will be available at the end of the month for $129, but you can reserve an order now. The company also announced a BM1880-based USB stick and compute module, among other products (see farther below). In conjunction with the Sophon BM1880 Edge announcement, Bitmain joined the steering committee of Linaro’s 96Boards community. The SBC is the latest of Linaro’s rather loosely defined 96Boards.ai family of AI-enabled 96Boards products. These include boards like the Sophon BM1880 EDB and HiSilicon Hikey970 that are equipped with neural network acceleration chips, as well as other boards without such accelerators such as the DragonBoard 920C and Rockchip Rock960, but which can also be used for edge AI applications. The Sophon BM1880 EDB is called the first ASIC-based 96Boards.ai product, even though only the BM1880 TPU is an ASIC, not the dual 1.5GHz Cortex-A53 cores that accompany it. The BM1880 TPU and the EDB board are designed for deep learning techniques, like facial recognition, object detection and recognition, license plate recognition, and voiceprint recognition “in real-time on small devices without needing an Internet connection,” says Bitmain. 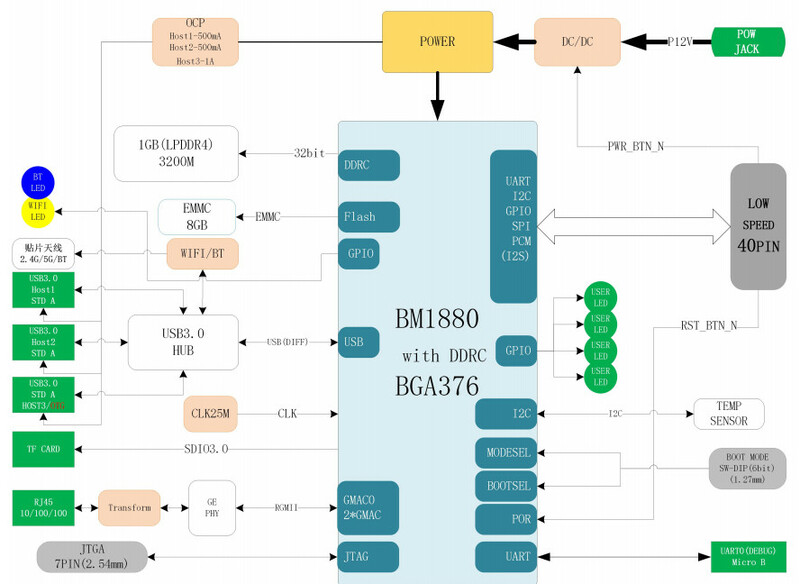 The BM1880 is available both in the dual -A53 version, which enables it to be used as the main processor, or as a deep learning co-processor without the -A53 cores. The BM1880 “can also receive video streams and image data from other hosts and then carry out inference and return the results back to the hosts,” says Bitmain. The BM1880 TPU offers 1 TOP performance on 8-bit integer operations and up to 2 TOPS with Winograd convolution acceleration, claims Bitmain. The company touts the TPU for its scheduling engine, “which supplies extremely high bandwidth data flow effectively to all the tensor processor cores.” The chip integrates 2MB of memory. The BM1880 TPU is accompanied by deep learning model compilers and an SDK. Deep learning frameworks like Caffe, ONNX, Pytorch, and Tensorflow “can be easily ported to the BM1880 platform,” says Bitmain. It also supports neural network models including CNN, RNN and DNN. The EDB board is said to offer further support for ResNet50, Yolo V2, GoogleNet V1, MobileNet v1/v2, SSD300, Alexnet, and VGG16. Aside from its processors, the Sophon BM1880 EDB (Sophon Edge) board is a pretty standard 96Boards CE SBC except that it’s a headless board without video ports and lacks the usual 60-pin high speed connector. The 96Boards compatible 40-pin connector is presumably where you’d add mezzanine boards for the announced Raspberry Pi and Arduino development modules. However, there were no details on the add-ons. This the first board we’ve seen with a RISC-V companion processor, which is unexplained except to say it’s a 750MHz chip. Presumably, this is an MCU-like RISC-V part for real-time processing, possibly designed by Bitmain. That’s a high clock rate for an MCU, so it might be an alternative Linux chip in addition to the dual -A53 block. A 750MHz clock rate is too low for any of SiFive’s Linux-ready RISC-V chips like the Freedom U540 and upcoming, second-gen U74 and U74-MC. Since Bitmain is a Chinese company, however, it might be one of the new, Linux-ready RISC-V derived C-SKY chips from Hangzhou C-SKY Microsystems. The Sophon BM1880 EDB is equipped with 1GB LPDDR4, 8GB eMMC, and a microSD slot. The board provides GbE, WiFi, and Bluetooth for networking, as well as 3x USB 3.0 host ports and micro-USB and JTAG debug interfaces. Specific Linux images are said to be coming soon. Bitmain also announced a USB-connected Neural Network Stick (NNS) implementation of the BM1880, much like Intel’s Neural Compute Stick and Google’s Edge TPU Accelerator. There’s also a 38 x 38mm Neural Network Module (NNM) based on the BM1880. Neither appear to offer the dual -A53 cores for autonomous Linux operation. Both require connected X86_64 computers running Ubuntu (NNS) or Ubuntu or Windows (NNM). Bitmain also announced a 19-inch 2U Sophon AI Server SA3 rackmount computer that incorporates three processing units, each with 6x of the earlier BM1682 processors, for 18 processors overall. The system includes an unnamed quad-core processor (probably an Intel Core) that supports Red Hat, CentOS, or Ubuntu distributions. A separate Embedded Mini AI Machine SE3 system equipped with the BM1682 targets the smart park market. The 210 x 115 x 45mm device supports 4x dynamic or 10x static facial recognition streams and offers single-precision peak performance of 3 TFLOPS with 60W consumption. Bitmain previously used the BM1682 for an SC3 deep learning accelerator card. No OS or additional processor was listed. Finally, Bitmain said it would launch a next-generation Cloud chip BM1684 TPU chip by the end of the year, featuring “significantly increased performance.” The chip will drive a new SA5 server. The Sophon BM1880 Edge Development Board (EDB) (Sophon Edge) is not yet available, but you can reserve a pre-order for $129 here for shipment due Nov. 30. 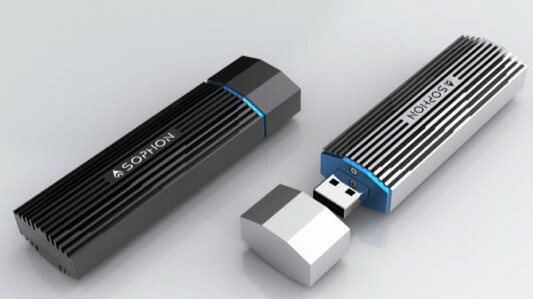 More information may be found on the 96Boards Sophon Edge page and Bitmain’s Sophon BM1880 EDB product page. The announcement of the Sophon BM1880 EDB, NNS stick, NNM module, and Bitmain’s other new products may be found here.